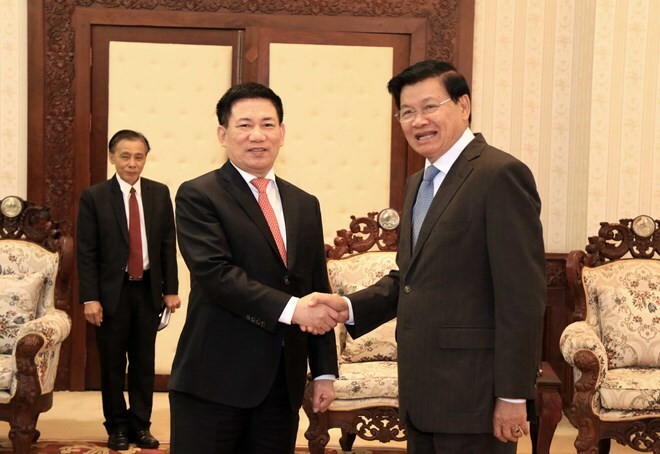 Vientiane (VNA) – Lao Prime Minister Thongloun Sisoulith and National Assembly Chairwoman Pany Yathotou valued the cooperation between the State Audit Organisation of Laos (SAL) and the State Audit Office of Vietnam (SAV) while meeting SAV officials on April 5. At the separate meetings in Vientiane, the Lao leaders described the SAV delegation’s working visit as a practical activity on the threshold of the 55th anniversary of the countries’ diplomatic relationship and the 40th anniversary of the bilateral Treaty of Friendship and Cooperation. They applauded the two audit agencies’ cooperation outcomes and orientations while appreciating the SAV’s effective and substantive assistance to the SAL, especially in improving Lao auditors’ capacity. Laos attaches importance to auditing and considers this an effective tool to monitor and control power and prevent power abuse in the management of public finance and asset, they added. The Lao Government and parliament leaders voiced their hope that the SAV will enhance cooperation with and assistance to the SAL, particularly in personnel training and experience sharing, thus helping to reinforce relations between the two agencies, as well as between the two countries. Highlighting the audit agencies’ sound relations, SAV Auditor General Ho Duc Phoc said over the last three years, the SAV has offered training courses for Lao auditors and sent experts to Laos to help with auditing activities. It has also assisted its Lao counterpart in strengthening its legal status, completing its apparatus, drafting an audit law, and integrating into the region. He asked the Lao National Assembly Chairwoman and Prime Minister to further facilitate the agencies’ relations. The SAV will continue helping the SAL perfect regulations and apparatus and promote auditing capacity, thereby contributing to the countries’ development, he added.